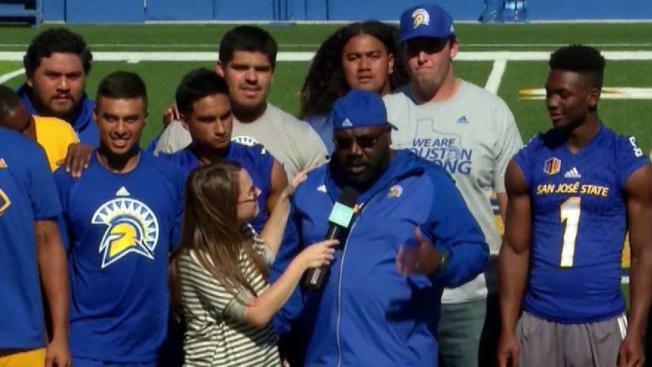 Ellen’s live camera crew went to San Jose State University to pay a surprise visit to Coach Alonzo Carter. Coach Carter previously busted out to the song “U Can’t Touch This.” The team posted that video over the summer. Coach Carter used to be a backup dancer for rapper MC Hammer. Coach Alonzo Carter, the smooth dancing San Jose State University football coach and former MC Hammer backup dancer, has a new famous fan: Ellen. The NBC personality was so impressed by Carter's sweet "Hammer Time" moves that she planned a special surprise for him and some other lucky Spartan football players. Carter and the squad thought they were being filmed for an EllenTube project, but the host decided to join them live from her studio. "Hey everybody," Ellen said to the group gathered on the field. "How's it going?" A split second of silence ensued before the group, led by Carter, erupted in a fit of pandemonium. When the group finally settled down, a brief back-and-forth followed as Carter was showered with praise from head coach Brent Brennan and cornerback Jermaine Kelly. "'Zo' is great guy," Kelly said. "From day one, he came in here, he took us all under his wing. He treated us like we were his sons." Brennan, who has known Carter for 20 years, knew he needed Carter on his staff when he took the head coaching job this season. "I've seen him change lives in the city of Oakland forever," Brennan said. "I knew when I got this job here I just had to have him be a part of it. He's got incredible energy. He connects with people on an incredible level. He's amazing." Since joining the Spartans — something Carter wanted to do in hopes of changing lives — community service has been at the forefront of his mission. He helps steer a program coined Beyond Football, which is designed to get players out into the community in hopes of inspiring others. Collectively, SJSU football players have completed more that 750 hours of community service since Carter jumped on board. "Whatever you name, San Jose State football, we in our community giving back trying to change people's lives," Carter said. That feat prompted Ellen to offered her final surprise: a check totaling $25,000 for the Beyond Football program.